AL We currently have no dogs available for adoption in AL, but do have dogs available in neigbouring states. Click HERE to see the list of states. AZ We currently have no dogs available for adoption in AZ, but do have dogs available in neigbouring states. Click HERE to see the list of states. 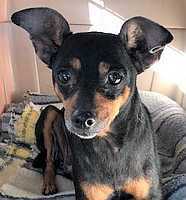 Burt: 7 year old, black/tan, neutered male, natural ears, docked tail, 13" 14.5 lbs. Shots -up-to-date, micro-chipped, rescued from hoarding situation. Burt is one of 8 mipins that IMPS took in from a horrendous hoarding situation. While in the care of the hoarder, it was reported that the dogs lived in airline crates in sheds, mostly in the dark, and most of the dogs with Burt being one of them, had lived in these conditions for a number of years. 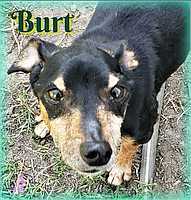 When Burt arrived at his foster home, he was very thin with dull, coarse hair. His mouth was a stinky mess that required dental attention. Burt was not socialized and he did not know how to appropriately interact with other animals and humans. He has lost both muscle mass and mobility from being confined in a small space for so long. It is just heartbreaking to think about how this poor boy has lived his life, and all of the things he has missed. He hasn't known freedom, love, compassion, security, interaction with people and other critters, and if how skinny and hungry he was is an indication, even basic, healthy food in a quantity to sustain him. Burt does have some issues, but nothing that a firm but loving correction, and a warm compassionate heart can't help him overcome. When I get frustrated with him, I stop and ask myself, how would I be responding right now to this situation if I had been caged up in the dark for years on end in isolation? I'm not nearly as forgiving or as willing to learn what is expected of me as Burt is. After being removed from this horrible situation, Burt has made steady progress toward becoming a normal, happy boy. He has regained some of his mobility, I am hopeful that he will regain all of it. He is learning how to interact with his doggie siblings and he's loving that interaction. Burt is learning what it is to run through grass and feel the sun warming him and he is adjusting to life in the light. He's even learned what rain is and what it is like to play in it. Burt is also learning what it is to be held by a human and have his back and tummy scratched next to eating, that is his favorite pastime. He's learning what it is to sleep in a bed and what it is to cuddle with his foster brothers and sisters and his human. Burt is now constantly at my side. He has been starved for affection and companionship and he wants this from a human. He is such a sweet, loving guy who wants to please. These are all wonderful experiences for Burt, but what he's needing now is his forever home and his forever human. He needs someone to bond and feel secure with and to be loved and respected. Someone that he can depend on to have boundaries, but to love him and provide for his needs. Burt deserved much better than the life he's had so far, but none of the past can be changed. Now that he is out of that disgustingly harmful situation, Burt needs someone to give him all the things he deserved but never got, and to give these to him for however long he has left. He needs someone to help him heal from the pain and loneliness of his past. Can you be that someone? NOTE: Burt is located in Springville, CA We will only fly this boy in-cabin with the Adopter. 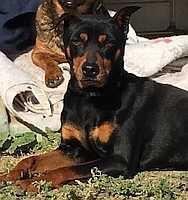 CeCe: 3 year old, Black & tan, spayed female. Natural ears and tail, 12" and 12lbs. Shots up-to-date & micro chipped. Rescued from shelter. 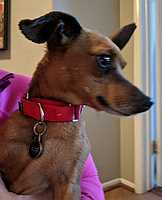 CeCe is a beautiful, petite girl who was rescued by IMPS just before she was scheduled to be euthanized. When she first arrived at her foster home, she went from wary but calm, seemingly uncertain what was happening to her, and not sure if she was going to be OK - to relaxing and becoming an easy going, low to medium energy, sweetheart. She follows me around, but is not clingy. She's fine as long as she can see me. If not, she makes the most adorable squeaking noises. She is always excited to see me and comes running for petting and attention. If you sit down, she will be in your lap and ready to cuddle. She has quickly burrowed herself deep into my heart. She loves burrowing under the covers to sleep by her human and doggie siblings, and sleeps quietly through the night. She will find a blanket during the day and wrap herself in it to sleep. She is housebroken and is not destructive. CeCe came into the resident dog pack quietly and with much dignity even with her uncertainty, and she gets along with both large and small dogs, and does not seem interested in the resident cat. She has been exposed to a number of humans in differing situations. She's been just fine and loves the attention. When CeCe was first brought into the care of the animal shelter, she was infested with fleas and it affected her hair. Her coat is already softening and growing back in very rapidly. She has let me medicate her, clean her ears, and bathe her without incident. She is pretty now, and will only become more beautiful with time. What CeCe needs now is a forever home where she is a member of the family, and will receive the love and care she's lacked so far. She is going to make a wonderful addition to the lucky family who adopts her! Better hurry though, because this one could easily cause a foster failure! 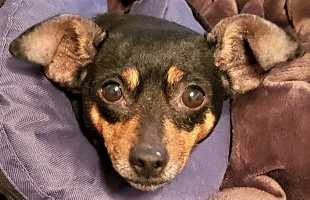 NOTE: CeCe is located in Springville, CA We will only fly this girl in-cabin with the Adopter. 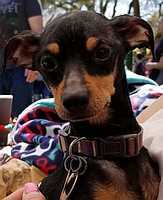 Squeak: 1½ year old, black & rust, neutered male, natural ears & tail, 12" 11 lbs. Shots up-to-date & micro chipped. Rescued by a good Samaritan. Say "Hi!" to Squeak! This little guy is a lover not a fighter! You could almost call him a velcro dog! Squeak likes going for walks, exploring the backyard, but most of all, Squeak loves snuggling! He's an "undercover" dog, loving to be in bed with his person. Squeak has gotten along well with his foster brothers & sisters. He has been exposed to toddlers, but, since he's as squiggly as a toddler, I recommend much older children. Squeak got his name by the puppy sounds he has made, and the only time he really barks is at dinner time, or when someone is at the door. A home where he has company most of the day with perhaps a mellow but playful dog would be good for Squeak. 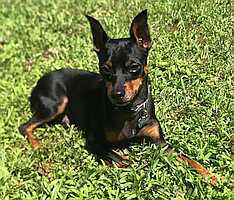 Lots of outdoor potty time is great for Squeak as he is still learning potty training. Since he has been in foster, he's slowly getting used to riding again, because he only goes fun places! I love this little guy, and he will definitely be a wonderful addition to the right home! Hes the happiest foster I've ever had! He's polite at mealtimes, waiting 'til his name is called. He doesn't try to hog anyone's food, but he and one of my dogs have been trading food bowls, each eating half their food, then switching ! Squeak is a pleaser, trying hard to understand what you want....he doesn't always get it, but he tries! What would make Squeak the happiest would be to live with a family or active person, where someone is home most of the time , who could give him the time & affection he loves! 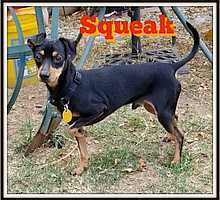 NOTE: Squeak is located in Roseville, CA We will only fly this boy in-cabin with the Adopter. 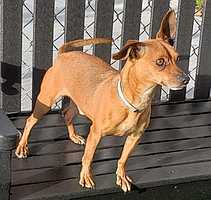 Liam: 3 yr old red male, neutered, undocked tail and uncropped ears. 10.4 lb. Fully vetted. Rescued from shelter. Liam is a wonderful snuggler. His fur is so soft and he loves to lay his head on your chest, leg or arm and admiringly stare at you. He loves to lay next to you and just cuddle. Liam is potty trained and walks well on a leash. He love to snuggle closely under the bed sheets. He is playful gets along well with other dogs. He tends to the alpha dog and takes a leadership role but fits in well with my own 4 dogs. He is playful and loves to follow me everywhere. Liam would be such a wonderful addition to someone who wants a cuddler and snuggler and who can give him a lot a loving he so deserves. Note: Liam is located in Rialto, CA. Cobby: 2 year old, black & rust, neutered male, cropped ears and docked tail, 16" & 18 lbs. Shots up-to-date. micro-chipped. Rescued from shelter. Cobby is a big, handsome boy. He is a bit underweight at 18 pounds, so once he gains the weight needed to cover his spine, he will easily weight 20 lbs. or more. 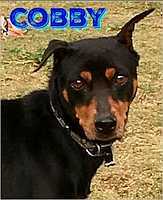 Cobby was picked up as a stray in a rural area. He was introduced into his foster home and the resident pack of dogs there with no issues. He was not sure about things, but was respectful and integrated without any issues. He likes to cuddle with the other dogs in their beds and roam the yard with the pack doing what dogs do. Cobby has not always received the best treatment from humans and is fearful until he gets to know you and can trust that he will not be hurt. He is starting to realize that not all humans are bad and that some have treats, and that getting scratches and hugs are a good thing. He is also learning that his foster mom�s bed is OK to sleep in, and it is soft, and the blankets warm, unlike the streets where he has been living. 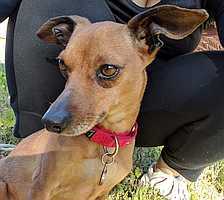 Cobby is a really sweet guy who shows all the signs of wanting to trust and have a kind and loving human of his own. The lucky people who adopt this handsome boy will need to spend some time building his trust and confidence, and their reward will be a loyal companion and a wonderful addition to their family. NOTE: Cobby is located in Springville, CA. We will only fly this boy in-cabin with the Adopter. CO We currently have no dogs available for adoption in CO, but do have dogs available in neigbouring states. Click HERE to see the list of states. CT We currently have no dogs available for adoption in CT, but do have dogs available in neigbouring states. Click HERE to see the list of states. DE We currently have no dogs available for adoption in DE, but do have dogs available in neigbouring states. Click HERE to see the list of states. 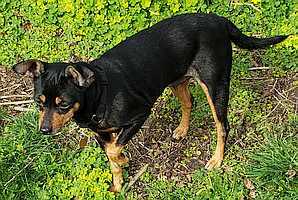 Brodie: 2 yr old black & tan male, neutered, docked tail and cropped ears. 10", 9.5 lb. Owner give-up. Brodie is a handsome little love bug. He hops in laps and give kisses as soon as he meets someone. He may not be good with very small children that make sudden moves, so probably kids over 6 would be fine. He is ok with other dogs, but needs some time to warm up to them, and the other dog here is a jealous little brat,so becoming friends took a while, they are now playing together. He loves to sleep with you, and cuddle up,but will stay off the bed if that's what you prefer. He is mostly housebroken, needs to be let out first thing in the morning. He marked the first few days he was here, but seems to have stopped now. He likes to play with his stuffed toys, especially the squeeky ones. He is good with cats, and after the first initial meeting, is now good with the bird in the cage. He really is a sweet boy, not overly rowdy or active,and minds pretty well. He will make someone a wonderful companion. Note: Brodie is located in Port Charlotte, FL - and we will not fly this boy. This page was last updated on Apr 20, 2019 by Mag at imps@mgbeng.com.